The Coastal Health District and the Coastal Resources Division of the Georgia Department of Natural Resources work together to test coastal beach waters for the presence of potentially harmful bacteria that could cause illness. More populated beaches are tested year-round on a weekly basis. 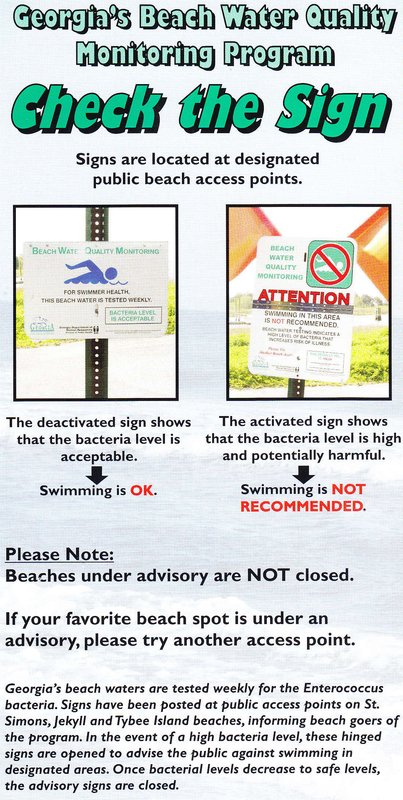 If bacteria levels are elevated, an advisory sign will be placed on the beach and notification sent out through local media channels and social media. Get the latest Beach Water Advisories. For additional information, please contact the Coastal Health District at 912-644-5217. Want to get notified when a beach goes under advisory? You sign up to receive email notifications at www.GaHealthyBeaches.org. Effective January 1, 2016, the Beach Monitoring and Notification Program began using a new bacterial level threshold – recommended by the Environmental Protection Agency (EPA) – in order to determine when swimming advisories should be issued. The new bacterial threshold value recommended by the EPA is more protective of public health. However, since Georgia’s beaches have good water quality overall, the new advisory threshold is not expected to appreciably increase the number of swimming advisories. Why is the water tested and what is it tested for? The water is tested as part of the Environmental Protection Agency’s beach monitoring program which includes all Georgia beaches. Water samples are taken all along the island and tested for enterococcus (pronounced: en•ter•o•coc•cus) bacteria which is found in warm blooded animals including humans but also birds, raccoons, deer, dolphins and other wildlife. Do you know where the bacteria come from? It is difficult to determine exactly where the bacteria come from but some sources could include animal waste, storm water runoff, or boating waste. What does it mean when a beach is under advisory? It means that the level of bacteria found in the water is above the Environmental Protection Agency’s recommended standards. When the level of bacteria is higher than it should be there is increased risk of illness to swimmers so the public is advised not to swim or wade in the water in that particular area. Will I get sick if I go into water that is under advisory? There is no way to say for sure whether or not you will get sick if you go into water that is under advisory but you will be at an increased risk of illness. Risk of illness comes from contacting beach water in several ways including ingesting water while swimming, getting water in the nose, eyes, and ears or getting water in an open wound. Some examples of possible illness include possible stomach upset, ear infection, sore throat, or wound infection. What do I do if I have been swimming in water that was under advisory but I didn’t realize it? There is no way to say for sure whether or not you will get sick if you were swimming or wading in water that was under advisory. The best thing to do is to be aware of any changes in your health. If you start to experience stomach upset, ear infection, sore throat, or wound infection, after you have been in contact with water that was under advisory, contact a healthcare provider. No, the beach is not closed. An advisory simply means that increased levels of bacteria were found in the water, not on the beach, which is why public health suggests no swimming or wading in the water (risk of illness comes from contact with the water). Does the advisory cover the entire island? No. An advisory only covers a certain area. Even if part of the beach is under advisory there are plenty of other beach access points to areas that aren’t under advisory. How do you know the bacteria are only in one certain area of the water? Beaches have been divided up into zones. Water samples are taken from the center of each zone and if bacteria levels are found to be higher in a certain zone then an advisory is issued for that area. Because it’s not possible to determine exactly where the bacteria levels switch from “okay” to “elevated,” the advisory is issued for a fairly large area. If water samples from more than one zone indicate higher levels of bacteria then multiple advisories will be issued but again, only for the areas where bacteria is higher. How long do areas stay under advisory? When an advisory is issued, another sample of the water in the area under advisory is taken within a few days and retested. An area will stay under advisory until the test shows that bacteria in the water have decreased to an acceptable level as determined by the Environmental Protection Agency. How often is beach water tested? Water at the beaches on Jekyll, St. Simons, and Tybee Islands is tested once a week, year-round. Beaches that are under permanent advisory are tested once a quarter (four times a year). What does it mean if a beach is under a permanent advisory? A permanent advisory means that there are continually elevated bacteria levels indicating a potential human health risk and therefore swimming or wading is advised against. Can I eat fish I’ve caught from a beach that’s under advisory? Yes, fish and other seafood caught in area(s) should be thoroughly washed with fresh water and thoroughly cooked before eating as should fish or seafood caught from any waters.